The predictions and statistics for this week, the Omega Dubai Desert Classic (European PGA Tour) and the Waste Management Phoenix Open (US PGA Tour) are now available on Golf Predictor. It's the last week of the Desert Swing on the European PGA Tour and although Rory McIlroy is still out injured, there is a strong field of tour members, not to mention Tiger Woods, in Dubai. Meanwhile, the US PGA Tour has made the short hop from California to Arizona, where the raucous fans can cheer on a quality field, with nine of the top twenty in the world rankings teeing it up! 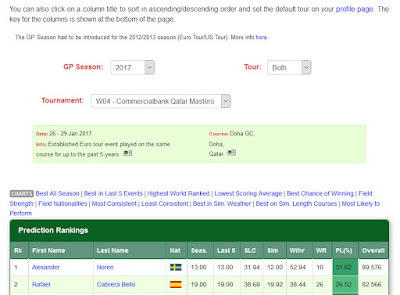 Jeung-Hun Wang (ranked 10th by Golf Predictor) won the Commercial Bank Qatar Masters on the European PGA Tour. The 21 year old South Korean won his third title in less than a year with a play-off victory over Jaco van Zyl and Joakim Lagergren in Qatar. Despite losing his overnight three shot lead and leaving his birdie putt agonisingly short on the final hole in regulation, Wang wasn't to be denied. He regrouped to take the title at the first extra hole after both his opponents narrowly missed their birdie putts. Our top ranked player, Alex Noren, finished in tied 21st and we had fourteen of the top twenty one plus ties (14/27*). Jon Rahm (ranked 34th by Golf Predictor) won the Farmers Insurance Open on the US PGA Tour. The promising 22 year old Spaniard won his first tour title with an incredible finish at Torrey Pines. Rahm broke free of a logjam with a birdie on seventeen and an incredible eagle at the last to win by two shots. In fact, Rahm had two eagles in his closing six holes for a closing 65 to win in style. Our top ranked player, Jason Day, was one of the several big names (including Tiger Woods on his proper return to the tour) to miss the cut. Overall, we had ten of the top twenty plus ties (10/27) in total. 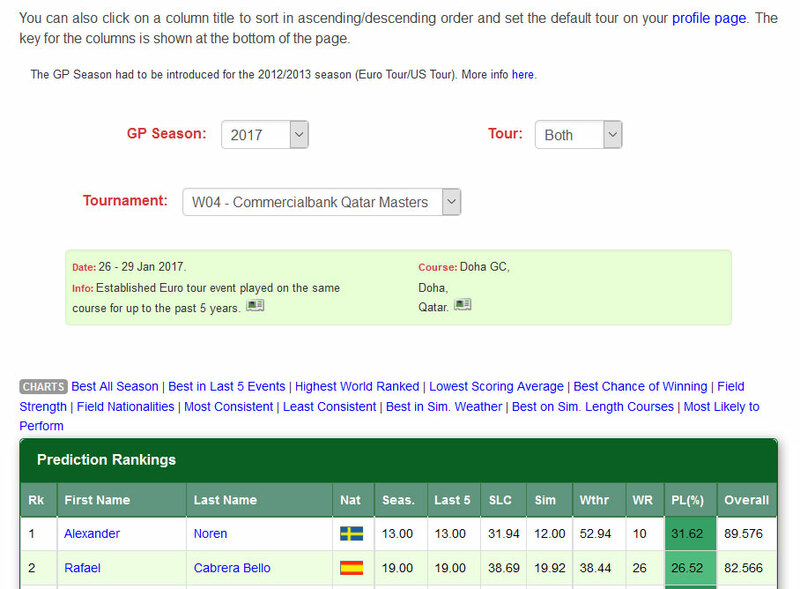 *Canizares withdrew, promoting Campillo into the top 27 of the GP rankings. All the dropdown fields on the site e.g. the GP Season, Tour and Tournament drop down lists on most menu pages. The text labels have been replaced with graphical labels which are directly adjacent to the left hand side of the field. This can be seen in the second screenshot above. Text boxes now have their label as default text within the field. Most have got new graphical labels also. The Change Password page has been revamped similar to the log in page. The Registration and Search pages have also been updated. The background colour for the information panel on most menu pages (see screenshots above) has been changed to improve display on different monitors. You can hover over the new graphical labels for the dropdown fields to see the associated label text. This does not work on mobile devices, so you can also click on the label to see the same text (click again to hide it). Some text and formatting has been changed on the site to improve display on smaller mobile devices. Certain text has made smaller on such devices and/or been abbreviated. The HTML/CSS for some site elements has been changed to reflect these new updates (e.g. there is no longer a need for separate containers for the label and the dropdown list. This may result in slightly different display formatting. I have tested these updates on desktop FireFox, Chrome IE11 and Edge and all appears to work as expected. I have also tested the changes on Android (Chrome) and iOS (Safari) phones. I had to make some small compromises to the display of these new features on mobile devices because of a minor layout issue on iOS. Despite the testing, there may be issues on other devices or issues that I have missed. Please contact me immediately if you experience any problems. You may have to reload pages that you have recently viewed to see the updates or get the page to display properly. The updated style sheets will also have to be reloaded, so please press Ctrl + F5 (Windows) on any such page to force your browser cache to update. Update: I have also tested the changes on a newer iPhone and an iPad and a similar minor issue as noted in point 5 exists in most orientations. It is very difficult to get the green boxes to align correctly on all mobile devices, but I will look to improve this in the coming days. I trust you will agree that these cosmetic updates are an improvement. Just another way to make Golf Predictor a little better! 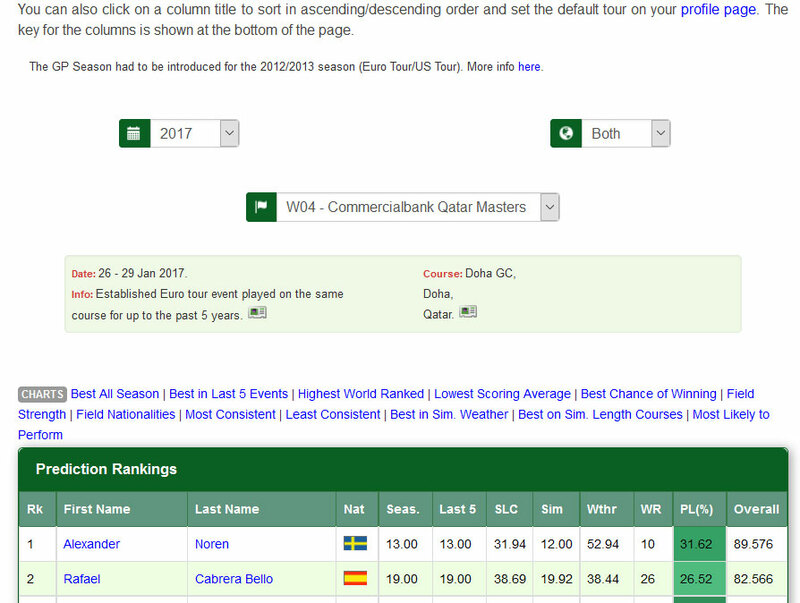 The predictions and statistics for this week, the Commercial Bank Qatar Masters (European PGA Tour) and the Farmers Insurance Open (US PGA Tour) are now available on Golf Predictor. The European Tour stays in the Arabian Gulf this week, where the action moves to Qatar. Meanwhile, there is a much better field in California, where eight of the top twenty in the world are teeing it up at Torrey Pines. However, all eyes will be once again on Tiger Woods, who's continuing his latest comeback on a course where he has had tremendous success in the past. Tommy Fleetwood (ranked 23rd by Golf Predictor) won the Abu Dhabi HSBC Championship on the European PGA Tour. The 26 year old Englishman won his second tour title with an impressive back nine performance in Abu Dhabi. After chipping in for eagle on the tenth, Fleetwood added three birdies, including a crucial one at the last, to post a score that his pursuers just could not match. Our top ranked golfer, Dustin Johnson, finished strongly with an eagle for tied second and we had twelve of the top nineteen plus ties (12/22) in total. Hudson Swafford (ranked 42nd by Golf Predictor) won the CareerBuilder Challenge on the US PGA Tour. The 29 year old American finally won his first tour title, also with an impressive back nine on Sunday. Swafford broke free from a crowded leaderboard with three birdies in a row from the fifteenth, beating Mr 59 Adam Hadwin by a single shot. Our top ranked golfer, Patrick Reed, finished in tied 12th and in an event where most of the bigger names failed to perform, we had only five of the top seventeen plus ties (5/20) in total. The predictions and statistics for this week, the Abu Dhabi HSBC Championship (European PGA Tour) and the CareerBuilder Challenge (US PGA Tour) are now available on Golf Predictor. Once again, several big names have been lured to the Middle East, where Rory McIlroy and Dustin Johnson are among the four top ten ranked golfers in the world playing in Abu Dhabi this week. Meanwhile, the US PGA Tour makes its season début on the mainland at La Quinta. All eyes at the annual birdie fest will probably be on Patrick Reed and Phil Mickelson, with the latter making his 2017 début in the Californian desert. In the opening golfing week of 2017 on the European tour, Graeme Storm (ranked 29th by Golf Predictor) won the BMW South African Open Championship. The 38 year old Englishman won his second tour title ten years after his first in a play-off against Rory McIlroy. Storm took a three shot lead into Sunday, but his cautious play say crowd favourite McIlroy overtake him on the back nine. However, sand trouble on the penultimate hole for the Northern Irishman saw them play the final hole four times before Storm weathered the McIlroy challenge! The world number two was our top ranked player and we had nine of the top eighteen plus ties (9/20) in total. In the first full field event of the year on the US PGA Tour, Justin Thomas (ranked 5th by Golf Predictor) won the Sony Open in Hawaii. The 23 year old American kept his hot streak going from last week and became only the second person ever (after Ernie Els in 2003) to win the Hawaii slam. Thomas started with the latest 59 on the PGA Tour and was never threatened after that, winning by seven shots in the end. Along the way he set the 36, 54 (tied) and 72 hole tour scoring records. Our top ranked player, Jordan Spieth, finished in third for second week in a row and we had ten of the top thirteen plus ties (10/19*) in total. *Si-Woo Kim didn't play, promoting Simpson into the top nineteen in the GP rankings. The predictions and statistics for this week, the Sony Open in Hawaii (US PGA Tour) and the BMW South African Open Championship* (European PGA Tour) are now available on Golf Predictor. It's the first week of the new GP season (the 2017 calendar year) on the European Tour and Rory McIlroy is headlining the field in South Africa. The Northern Irish star is repaying Ernie Els for his appearance in the 2015 Irish Open and is the unbackable 2/1 favourite in a weak field. Meanwhile, the second leg of the Hawaiian swing is the first full field event on the US PGA Tour in 2017 and has a strong field this year with an impressive eight of the top twenty in the world teeing it up at Waialae. *The full name of this event is The BMW South African Open Hosted by City of Ekurhuleni, which is a little too verbose for Golf Predictor! Justin Thomas (ranked 12th by Golf Predictor) won the SBS Tournament of Champions. The 23 year old American won his third tour title and first on home soil in Hawaii. Despite having built up a five shot lead with five to play, Thomas was almost caught by the in-form Hideki Matsuyama after the Japanese star eagled the fourteenth and Thomas double bogeyed the fifteenth. However, he steadied the ship and a strong finish saw him win by three shots. Our top ranked golfer, Jason Day, finished in tied 12th on his return from his back injury. Overall, we had eleven of the top fourteen plus ties (11/16) in this restricted field event. The predictions and statistics for this week, the SBS Tournament of Champions (US PGA Tour) are now available on Golf Predictor. It's the first week of the new GP season (the 2017 calendar year) and it's time for everyone to look forward to another full year of golf! I would like to wish all readers/users a Happy New Year and a prosperous 2017 using Golf Predictor!